The Saskatchewan Geological Survey is at the forefront of using three-dimensional (3D) geological modeling technology to better understand Saskatchewan’s mineral and petroleum resources. Generally, people are familiar with 3D technology. 3D movies have been around since the 1950s and have recently experienced a renaissance. Medical examinations like MRIs produce a 3D image of the inside of your body. You can even tour most of our planet’s surface in 3D with Google Earth. 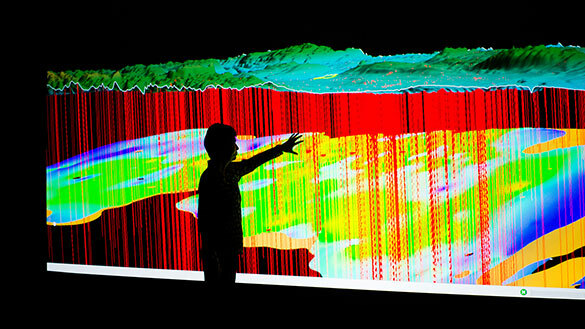 Today, geoscientists use 3D modelling to help visualize what is beneath the Earth’s surface. These models help us to understand a variety of features such as the nature and context of mineral, water and petroleum resources. We can assess the potential for catastrophic events such as earthquakes, volcanic eruptions, and landslides. It also gives us a clearer picture of the environmental and geological evolution of the Earth since its formation 4.5 billion years ago. Traditionally, geoscientists have used paper and computer software to create two-dimensional (2D) maps and cross-sections of the geology of the Earth’s interior. Utilizing drill hole analyses and geophysical data, these maps approximate the distribution of important geological objects buried underground. Advances in 3D technology, computing power and software now allow us to model subsurface geological objects and their relationships in 3D space. With this capability, geoscientists can assess geological information using an infinite number of viewing angles to make more informed decisions and conclusions about the rocks and formations they study. the prospective geology beneath the sedimentary cover rocks in the Flin Flon to La Ronge area, an untapped potential resource for gold and base metals. The SGS is also working towards a model of Saskatchewan’s vast oil and gas reservoirs in the Western Canadian Sedimentary Basin. Saskatchewan is proud to lead in 3D geological modelling and to share our knowledge and experience with the world.